March 26, 2013 — Under legislation Gov. Bob McDonnell is set to sign into law, the Grantor’s Tax property sellers must pay will go up July 1, 2013 from 10 cents per $100 to 35 cents per $100. The upshot: If you’re selling your home this spring as two of my clients are, try to close before Tuesday, June 30 in order to pay at the the existing rate of 10 cents per $100. Keep in mind there could be a rush to close on that Monday and Tuesday so best to aim for that week beforehand. This 250% increase — ouch! — does come with the projected benefit of more state transportation revenues funding road improvement projects in Northern Virginia, including Metrorail’s Silver Line extension to Dulles airport and Loudoun County. For the sale of a $500,00o home, the Grantor’s Tax in a settlement in June is $500. After June, it will be $1,750. The soon-to-be-law, aka House Bill 2313, reportedly provides close to $900 million a year in statewide funding and more than $300 million annually for Northern Virginia. We certainly could use it! Working closely with NVAR were Delegates Dave Albo, (R-Springfield) and Jackson Miller (R-Prince William), and Senator Janet Howell (D-Reston). This trio succeeded in reducing the initially proposed Grantor’s Tax increase of 40 cents per $100 to the 25 cents per $100 in the bill. Among the alternatives to the Grantors’ Tax increase was a local income tax increase of 1%. In the end, the Gov. McDonnell’s highly-touted transportation funding bill raised revenue from several sources including an increase in the sales and use tax, car titling fees and hotel occupancy taxes. All of those taxes are still said to be lower than those in D.C. and Maryland. January 27, 2013 — If you’re even remotely interested in what the ever-expanding population in Northern Virginia is doing to school boundaries there, be sure to read this piece in the January 27 edition of The Washington Post. The upshot: From the dozens of clients I’m serving I’m learning you can’t count on your children attending the same elementary school during all of their elementary school years, especially in Loudoun County. The same may go for middle schools and even some high schools. The challenge for school officials striving to maintain the quality of education is to balance enrollments amid spurts in growth as new communities develop in places such as Ashburn, where I’m finding several clients the next homes.In Loudoun County, the population shot up 84 percent from 2000 to 2010 according to the U.S. Census. The Weldon Cooper Center for Public Service at the University of Virginia estimates Loudoun’s population has risen another 7 percent in the past two years, according to data released January 25 here. “People buy homes thinking they will be attending that particular school through the life span of that household,” Ajay Rawat, coordinator of facilities planning services in Fairfax County Public Schools, told the Post. In many parts of the region, that’s no longer a safe bet; parents can’t count on moving into the neighborhood near the school with the particular attention to autistic students or the Spanish immersion track or the technology magnet program. This also could affect the attractiveness of a home from a would-be buyer’s perspective and thus its market value. Just about every redistricting plan sparks some type of a a battle. People scrutinize the lines and talk to neighbors. They send e-mails — 100 to 200 every day, one Loudoun board member said. They question engineering studies and linear regression models of population growth. They wear school colors and crowd into public hearings — more than 2,000 at a single meeting in Fairfax several years ago. 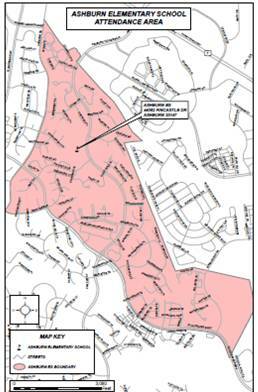 You can check the existing and the planned Fall 2013 shifts in elementary school boundaries for Loudoun County here. The Post’s article helps explain how complicated in can be to project changes in school populations. School officials analyze birth rates, housing starts, current enrollment and a host of other factors. In Fairfax, administrators didn’t anticipate a recent large influx of immigrants with larger families or a bump in enrollment after the economic crash that they think came from parents no longer able to afford private-school tuition. In Loudoun, when building stopped after the crash, they were amazed that they were still seeing, get this, more than 2,000 new students a year. Want to see how difficult it can be to reset school boundaries? Try this tool offered by Arlington County.